Mary Volmer is the author of two works of historical fiction set in the United States in the 1800s. Both of these novels shed light on women in roles largely ignored by standard history books. 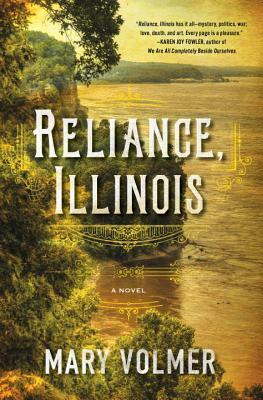 In Reliance, Illinois, the teenage protagonist enters the service of Miss Rose Werner, a suffragette and purveyor of black market birth control. In Crown of Dust, Alex Ford, a young woman disguised as a man, arrives at a California settlement to pan for gold. Kirkus Reviews stated, "Volmer paints a moving portrait of outcasts and nonconformists who build their own community." Volmer grew up in Grass Valley, a rural community in California that was a key location during California's Gold Rush of the 1800s. She completed her undergraduate work at Saint Mary's College in Moraga, California, as a scholar-athlete, playing basketball. She then earned a master's degree from the University of Wales, Aberystwyth, where she was a Rotary Ambassadorial Scholar. Returning to Saint Mary's College on a Chester Aaron and Agnes Butler Scholarship, she completed a master of fine arts and currently teaches there. She lives on the campus with her husband and son. Marianne Lonsdale first met Mary Volmer at the Community of Writers at Squaw Valley. They met recently at a coffee shop near Saint Mary's College and discussed the rigors of research, the value of applying to residency programs even if you're not accepted, and the similarities between playing sports and writing. 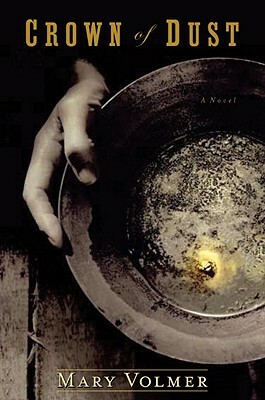 Marianne Lonsdale: Your first novel, Crown of Dust, takes place in the 1850s while Reliance, Illinois opens in 1873. What draws you to historical fiction? Mary Volmer: I read a lot of historical fiction growing up. My mom is a reader, so there were always books around the house. As a kid, I loved being transported to another, desperate time. As an adult, I began to recognize parallels between times. I'm fascinated by these parallels. And by the mistakes we make again and again. My second novel opens when there was a worldwide depression partially caused by real estate and bank fraud, something we've experienced again in recent years. Civil rights victories won after the Civil War were being undermined by the rise of Jim Crow. Women had once again been denied the right to vote and govern, and the first federal "obscenity laws" made the advertisement and transport of contraceptives through mail illegal. We've been legislating women's bodies (trying to) for some time. Mark Twain is purported to have said, "History doesn't repeat itself, but it often rhymes." These rhymes are critical to my writing. After completing my undergraduate studies, I spent a year in Wales as a Rotary Scholar. As part of the arrangement, I gave talks on California Gold Rush history. In reading history books to develop my talk, I realized how little women were featured in the pages. So, I tracked down journals and first-hand accounts by women. My focus isn't solely women. Men greatly outnumber women in my first book. But women's history is fruitful territory for fiction. There are so many untold stories. ML: I'm in awe of your ability to weave so many interesting details of the time periods in your novels. How do you research the historical periods? MV: I take it in stages. After I become obsessed with a time period and place, I start with a global view. I find out what was going on in the world. Even if my characters are not fully aware of these events, their lives will be, to various degrees, affected. Then I narrow my focus. Much of my research begins online, then I head to libraries. I would be lost without libraries and librarians. I read period newspapers, novels, and magazines. I read journals and firsthand accounts and biographies. I look at maps and draw (I love maps). For my second novel, I covered one wall with Civil War portraits and sketches and used them as models for characters. Research trips to locations are helpful, too, though you can't return to a time. I first thought Reliance, Illinois would take place in St. Louis and traveled to that city. But I went across the river to Alton, Illinois, and was drawn to the bluffs and prairie and the volatile history. Reliance is not a real town. I created it out of several towns in western Illinois, including Alton. The town's name and the book's title comes from Emerson's essay, "Self-Reliance." ML: While you are writing, having your research easily accessible must be critical. How do you organize your materials? MV: As an ugly mess at first! I'm not sure what I'm looking for or what I'll need at the beginning. I use a crate of hanging files and start adding tabs. For Reliance, Illinois, some of the tabs were Obscenity Laws, Marital Law, Contraceptives Law, Mississippi Flora and Fauna. Oh, and Clothes. I don't care about clothes, in general, but there's a lot of drama and social history wrapped up in women's clothing. I needed to know about bust lines and bustles because my characters would be judged by them. I needed to know just how many inches those bustles took up on dresses. ML: I'm always interested in the different approaches authors use to develop their books. How do you construct a novel? MV: I handwrite notes on yellow legal pads: character notes and story notes that make their way to three-ring binders. Once I know what notes will be important to the story, I type them up and keep them as files on my computer so I can find them easily as I write and revise. My first novel, Crown of Dust, was pretty straightforward, written in present tense and taking place over just a few months. The second novel was more complicated. I had great difficulty determining the structure and the voice. I needed a retrospective narrator, capable of looking back at herself with humor but who was still very much subject to the drama and emotion of the scene she was recounting. Harper Lee's To Kill a Mockingbird, Lynn Freed's Home Ground, and Dickens’s Great Expectations were my models. I took those books with me wherever I went, along with Twain's Life on the Mississippi. And Ivan Doig's Whistling Season. A bookstore owner near Seattle recommended this book for its narrator, and I adore it. I had great difficulty determining the structure of the second novel. I read plays to get a better sense of how scenes build on one another and ended up adapting a three-act structure for the novel. Reading plays, I learned to visualize the emotional arc of each act and craft scenes to fit the arc. Recently, I had the chance to study dramatic structure with Angie Powers, a screenwriter who runs a series of writing courses with novelist Elizabeth Stark, called "Book Writing World." It's the first class I've taken since grad school, and it's been tremendous. ML: Had you finished your first novel before you became a mother? MV: My first novel was written before I had my son. I had about twelve chapters drafted of my second novel when I became pregnant and knew I'd better finish it in the next nine months. I wrote the last 24 chapters before he was born. During my first three months as a mother, I didn't write, although I read a lot. Then my husband was able to take parental leave, and I returned to teaching and writing. A colleague was on sabbatical and let me use her office, so I had the gift of time and space. My husband is a math professor and a resident director in a freshman residence hall. We live in the hall with students, a bit like a live-in aunt and uncle who can help with calculus and composition. Beyond that, my job is mostly to listen when students have a problem and to connect them with people who can help. I learn a great deal from stories students share with me, and I have no doubt they have made me a better, more aware and compassionate teacher and writer. Much of the emotional content of the mother-daughter relationship in Reliance, Illinois came from such conversations. ML: You've participated in the annual Community of Writers at Squaw Valley conference for several years. What has this community meant to your writing? MV: Oasis—that conference has been an oasis for me. I participated in the workshops for two years and then returned as a volunteer, doing anything that needed to be done. I was invited to read at the annual alumni reading when my first book was published. And last summer, after the publication of my second novel, I returned as a workshop leader. The community keeps pulling me back. There's little pretension. The emphasis is on the art and craft of writing, though publication is part of the discussion. I also met my agent, BJ Robbins, there when I was just starting to write. She led one of my workshops, and I thought she was so smart and kind. ML: You've been accepted into some prestigious residency programs, including Hedgebrook and the Vermont Studio Center. Any advice on getting accepted into artist programs? MV: Yes, apply! Even if you don't get accepted. The questions you're asked on applications force you to consider why the work matters to you. Why it's necessary. Finding those words is incredibly useful because you can return to them to reaffirm your purpose when you become overwhelmed and frustrated. If you do get accepted, the people you meet at residencies are as important as the work you get done. At Hedgebrook, I had dinner with six talented and diverse women each night. One of them was Gloria Steinem. Unbelievable. Because of her, I realized how closely the modern struggle for women's rights resembled the struggles in my book, even though it is set in the 1870s. Women have gained freedoms since the Civil War, but we're still fighting for many of the same rights. At the Vermont Studio Center, I met Bronwen Hruska from Soho Press, who's published both my novels. She was there working on her first novel, Accelerated. The Vermont residency included all types of artists, and it was fascinating to meet painters, sculptors, and photographers, as well as other writers. I learned a lot from the painters, including how stretching that canvas is the beginning of the work, the first movement towards finding the picture that will emerge, or, in my case, the emerging story. ML: Two important parts of your identity are athlete and writer. You run almost every day. How does being an athlete influence your writing? MV: The discipline of sports carries over significantly to my writing. You show up to practice every day and work hard, whether you feel like it or not. You understand that you won't always win, that the work is not always pleasant. And that your ability to endure difficulty and discomfort is as important as your talent. You learn what your limitations are and how to play to your strengths. Also, in sports and in writing, you aim to lose yourself in the moment. You have to learn not to turn away from that moment or the ball might hit you in the head. Or you might lose the emotional center of a scene. All that said, the win is not as obvious in writing as it is when playing a sport. You never really win with writing. I don't play basketball much anymore, but I try to run and write every day. ML: A common refrain in writing is to write what you know. I'm not sure how that applies to historical fiction. MV: The majority of what I write about is not bound or limited by a time period. The real story is in the relationships between people. How communities respond to crisis. The nature of love and loss. The complicated bonds between mothers and daughters, between friends and lovers. The dynamics of power in small towns. All of these concerns are timeless. They can be observed every day. The rest, I can learn. ML: What are you doing now? MV: I'm well over 100 pages into my third novel, and I'm teaching as well. I'm excited about the book but can't talk about it yet, except to say it's contemporary and quite enthralling.